Don’t let this busy season get you down. With good planning, a cheery outlook, and regularly scheduled breaks, you’ll have a profitable and stress-free holiday. We’ve got nail art designs for Christmas and Hannukah and Kwanza! We’ve got simple and complex designs. And we’ve got hundreds of photos to browse and lots of step-by-step demos to learn from. You don’t have to be Martha Stewart to create the perfect atmosphere. Read articles and view photo galleries on little touches that make a big difference. Christmas is the best time of the year for gift certificates, couples services, and selling little extras like nail art and paraffin dips. See our archive of articles on making the most ($$) during this prime time of the year. Hmmmm … what to give to clients both naughty and nice? How about a gold-trimmed clutch with a glitter polish tucked inside? 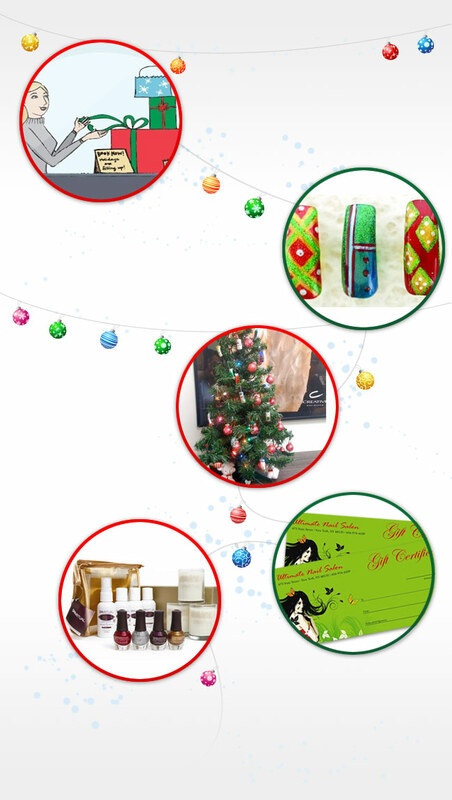 Click through our gallery of gift ideas and retail products packaged festively and for impulse buys.